It’s certainly an old sports cliché, but one that is true at the core – it’s hard to beat the same team three times in the same season. The Massachusetts men’s basketball team will have to overcome the odds and try to do just that, as it plays No. 9 seed La Salle in the second round of the Atlantic 10 tournament on Thursday after defeating the Explorers in two previous matchups this year. 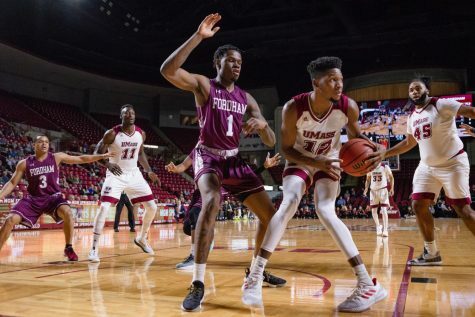 UMass faced a similar scenario last season when it beat Rhode Island 66-61 in the second round of the tournament in a come from behind victory after beating the Rams twice earlier that season. 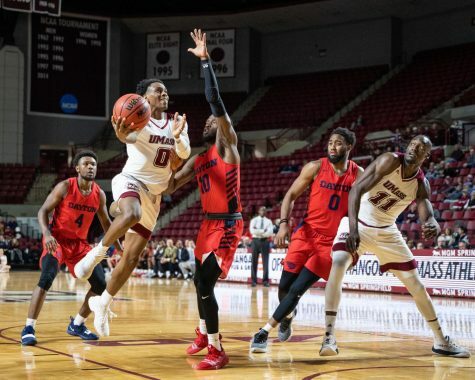 In the first matchup against the Explorers in Philadelphia, the Minutemen escaped with a 71-65 victory on Jan. 7, and beat them again one month later 66-59 at Mullins Center on Feb. 8. “La Salle is the game we have in front of us,” head coach Derek Kellogg said when asked about the A 10 tournament. But there’s no avoiding Jordan Price when looking at La Salle’s roster. The 6-foot-5 do-it-all guard leads the Explorers with 17.3 points per game and torched UMass for 30 points in their last meeting. His ability to score on the perimeter or inside against smaller guards makes him a matchup nightmare for anyone trying to defend him. Derrick Gordon said he’s ready for the challenge. “I’m not expecting him to do anything that I don’t know about,” he said. “He’s an aggressive player that loves to score and shoot the ball. 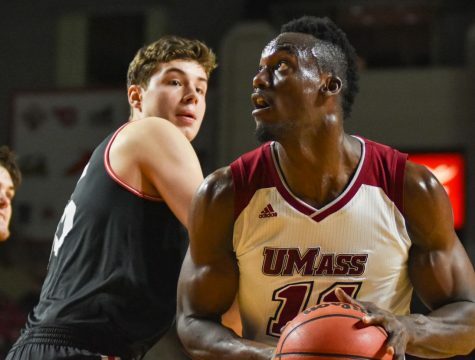 While Price will be getting most of the attention, it’s important the Minutemen contain La Salle’s frontcourt headed by Jerrell Wright and Steve Zack, two players that match up well against Lalanne and forward Maxie Esho. Wright is averaging 12.0 ppg and 6.6 rebounds per game while Zack entered the A-10 tournament player with 8.0ppg and 8.9 rpg to his name. Kellogg said a key focus against the Explorers is defensive rebounding and keeping big men like Wright and Zack off the glass. Kellogg also said reserves Tyler Bergantino and Zach Coleman will have to play crucial minutes down the stretch when Lalanne and Esho need breaks to make sure they keep the game in control. 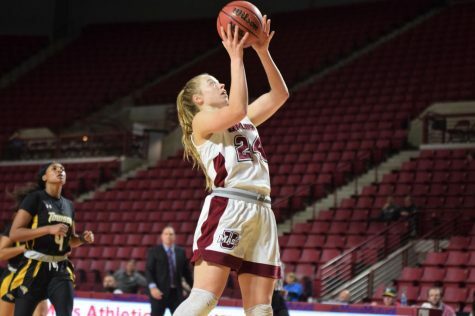 “Any opportunity I can get to come on the court and doing something to help my teammates out is always an opportunity I look forward too,” Bergantino said. La Salle will be looking to build its momentum after defeating No. 2 seed Dayton on Saturday in its regular season finale 55-53. Prior to the win, the Explorers lost four straight. 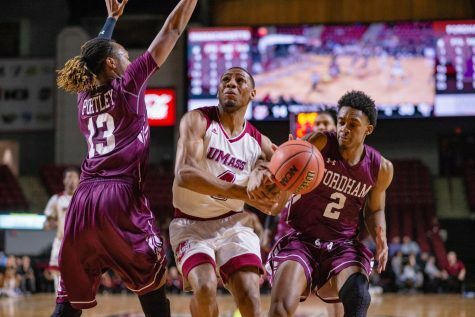 UMass enters Thursday’s game losers of back-to-back games, having dropped five of its last six games. 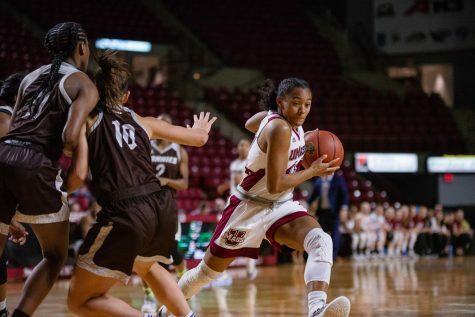 Despite sitting at the eighth seed, Kellogg believes the Minutemen still have one run left in them and noted that this year, the A-10 is as wide-open as its ever been. Tip off from the Barclay’s Center is at noon on Thursday and can be seen nationally on NBC Sports.